POSSIBLE 10 Free Coke Points - Who Said Nothing in Life is Free? Let me know if it works for you !!! It finally worked for me YEAH !!! It didn’t work for me but I will check back in a couple of days to see if it showed up. Had 2 caps so, gave it a try. Entered ‘gift’ and got the screen above. Then added the code (without logging out). Got the 13 points and free entry for the crane game. Had to logo out and back in to be able to enter ‘gift’ and the next code to get another 13pts and free entry. Yeah.. you have to enter GIFT, then the code. Log out, Log in, Enter GIFT, then the code.. That worked for me multiple times. Fine print in there – it has to be from a 20oz drink. All of mine are from 2Ls. It worked for me, thanks. I did the same as Mike. Don’t log out in between. probably didn’t work after first implementing it, coke always has that problem. Is there a way to determine the cap is from a 20oz drink? I followed Mike’s instructions above and it worked for me. I’ve entered 3 times so far. It states you’ve received 3 points but it’s adding an additional 10 to your point balance. Thanks!! Wish I knew about this earlier, I entered about 10 caps, all from 20 oz. But, I did hold some back so will give it a try. Thanks so much. I went from 12 points to 249 points! 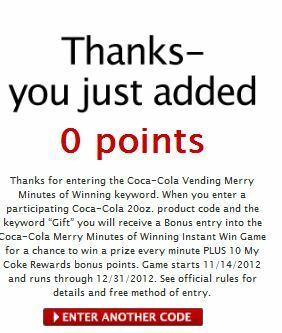 I was able to get the bonus points with a coke cap – and a free entry to the game too. Sadly, I can’t play the game today since I already used my 5 chances for the day. Thanks for the bonus points! didn’t work for me, followed the instructions but just got 3 points, no extra 10 :(, it was a regular old 20 oz. coke bottle my son bought today. Did it reflect in your total? Just wondering because I added one and it told me I got 3 pts., but I looked at my total and it added 13 pts. Bummer! Don’t know why it didn’t work. i have like 10 caps that ive saved up and its working for me! so excited YAY!!!!! update from my previous comment: i added 133 points just now…what i did was enter the cap code then entered the GIFT code…do not hit multiple codes and enter it that way….it wont prompt you for the game…i was able to play the game 5 times which was the max unfortunately didnt win anything! I followed Zelda’s instructions (going through multiple codes link) and had no problem at all. I played the game all five times (you have to click on “DETAILS” link. Thanks for the info, I’ll try to enter some when I get home. Working for me now.. Thanks for the information, guys! I followed Zelda instructions, received 39 pts and play game 5 times. Didn’t win anything this time. Do I enter GIFT, then hit enter (which shows 0 points added)…..THEN my code?? or is it GIFTthecodelettersalltogether THEN ENTER? Is there anyway to tell if the caps I have are from 20 oz or 2L?? Worked for me on the two caps I had by my computer. Now I am going to enter the other 40 caps I have I don’t drink pop but everyone gives them to me. Renee, I am with you. I don’t drink that much, but all my coworkers collect them for me. Thankfully I’d only entered 16 points before I saw this post, so now I’m reaching my 120-point max with all the coke caps they’ve collected! It worked for me….enter 4 of the 3pt caps and received 52 points total!! Thanks! – Typed in “GIFT” in the code field. – Got “You just add Zero Points” message. – Repeated all of the steps until my account was full! … And at the end, I was able to use my InstantWin Credits to play the HolidayGiveaway InstantWin Game 5 times and the COstco InstantWin Game 5 times… 10 plays! It only worked for me if I put in a cap code first, and then did the GIFT code. I put in about 15 caps that way – logging in and out after each one and I scored an extra 150 points. I’ve had two qt size storage bags with caps that I’d been holding onto forever that someone had given me. Some were so old they had 15 characters so I couldn’t use them but I did get over 1000 points in the last two weeks. Now I’m sorry that I told her to give future caps to someone else cause it seemed like too much work for 3 points! Just finished putting my caps in. Even a Minute Maid OJ On the Go lid worked. Worked for me. Thanks for letting us know!